Paper Towels: still better than air dryers. 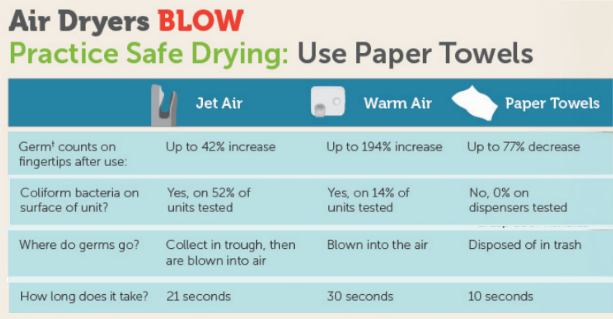 We’ve talked before about the health benefits of drying your hands with paper towels vs. air dryers. The friction from rubbing your hands with paper towels is essential to removing illness-causing germs. Now Kimberly Clark Professional provides some eye-popping numbers. Turns out, air dryers aren’t just less efficient at removing germs, they actually increase the amount left on your hands. That’s right, after you’ve gone through the trouble of properly washing your hands — humming two verses of Happy Birthday and everything– air dryers turn right around and blow a bunch of germs on your hands. Air dryers increased the number of germs on user hands by up to 194%. Furthermore, unlike paper towel dispensers, air dryers are covered with bacteria. So you’re doomed germy hands the moment you touch one.